Createspace Independent Publishing Platform, 9781539413387, 406pp. Out on the frontier, where the Directorate's law fades, and invasions from beyond the Cinderveil are a constant threat, life is hard. Ryle knows this better than most. With a grifter for a mother, and a bandit for a father, he spent his childhood picking pockets and slitting throats to survive. And that was before Kilgren, Ryle's unstable and vicious father, betrayed his family and the realm. For five years, Ryle has run from that legacy. He's earned a swordmark, fought to make a new life for himself, but never escaped. Until now. Rumors are swirling that Lastrahn, lost Champion of the House of Reckoning, has returned to hunt down Kilgren and end his mad schemes. If Ryle can find the Champion, he might get the shot he desperately seeks to bring his father to justice and close the door on his bloody past. Hanging in the balance? An impending war. A forsaken love. And the secret of a mysterious tower in the west that may hold the key to it all. A place known as Gearspire. 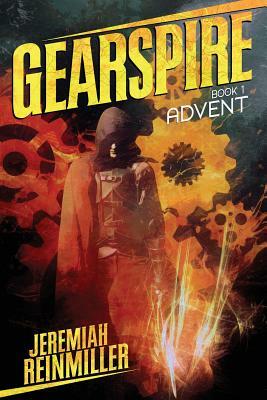 Gearspire: Advent is the first book in the Gearspire dark fantasy trilogy. Jeremiah Reinmiller is a lifelong computer geek, martial artist, and native of the Pacific Northwest. When he's not building clouds (the computing kind, not the rainy ones) he's probably hunched over a keyboard hammering out words in a semi-organized fashion. His stories have received the 2014 Sledgehammer Writing Award, and been published by Subtopian Press, Abyss & Apex Magazine, and Cantina Publishing. He resides in Vancouver (the one in Washington, not Canada) with his wife and their two cats. Information on what he's up to, and more of his stories can be found at www.jqpdx.com.